Pembroke pines is the largest city in Broward County, expanding 35 miles east and west with a population of over 138,000 in 50,000 households. Pembroke Pines is surrounded by Cooper City to the North, Hollywood to the East, Miramar to the South, and the Everglades to the west, past Interstate 75. Pembroke Pines is thought to be originally named after the Earl of Pembroke, who resided in the area many years before the city's incorporation in 1960. The city originated as a small town of farmers and war retirees looking to build their own homes on large pieces of land without developer interference. Pembroke Pines' population began its boom in1992, when Hurricane Andrew forced countless homeless Miami residents to move north to Broward. Interesting Fact: the Pines Blvd and Flamingo Road intersection in Pembroke Pines was declared the most dangerous intersection in the entire US by State Farm insurance in 2001. The cross-streets has since been rebuilt. If you and your family are looking to move into a larger house in a green, quiet neighborhood, Pembroke Pines is the place for you. Moving On Up™ moves homes and offices locally for all of South Florida based on a low hourly rate. If you would like an estimate for your move to Pembroke Pines, give us a ring at 1-800-945-9569 to speak to a moving consultant now. Moving On Up™ also has continuously changing package deals and other seasonal promotions to help you save big! Current Pembroke Pines residents who are moving out of states should visit our long distance moving page for more information on interstate moves along the east Coast or across the country. For your convenience, Moving On Up™ provides one month FREE storage for Floridians relocating locally or interstate. Ready to move? 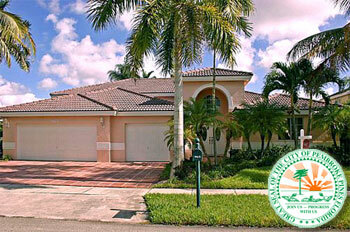 Contact Moving On Up™ now for your free in-home visual estimate in Pembroke Pines. To schedule your estimate, submit your quote now or speak to a moving consultant at 1-800-945-9569.